Otto Porter Jr. scored a season-high 29 points and John Wall had 22 points and eight assists in Washington's 124-114 victory over the New Orleans Pelicans on Saturday night. WASHINGTON (AP) — After struggling defensively this season, the Washington Wizards took advantage of another team’s guarding woes. 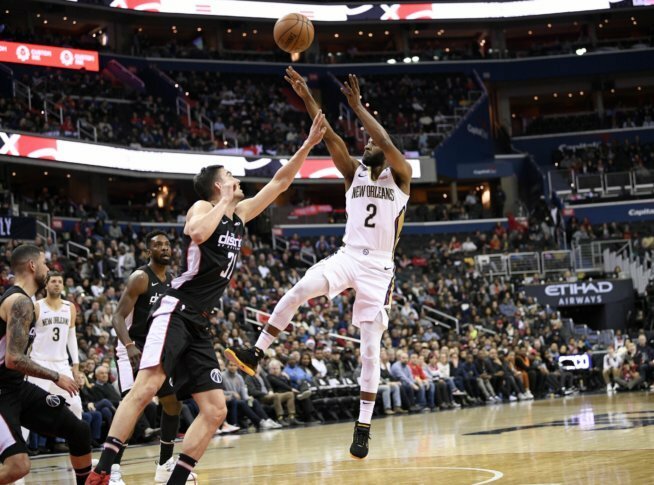 Otto Porter Jr. scored a season-high 29 points and John Wall had 22 points and eight assists in Washington’s 124-114 victory over the New Orleans Pelicans on Saturday night. Austin Rivers had 12 of his 18 points in the fourth quarter for the Wizards, who shot a season-high 56.7 percent (51 of 90) in a game between the league’s second- and third-worst defenses entering Saturday. Both teams shot about 62 percent in the first half, but the Wizards held the Pelicans to 17 of 48 from the floor (35.4 percent) after the break. Beal also had 18 points, one of six Wizards to score in double figures on a night the Pelicans were without injured All-Star forward Anthony Davis. Julius Randle tied a season high with 29 points and grabbed 15 rebounds. He started in place of Davis, who was ruled out during pregame warmups after straining his right hip in Friday’s loss at the New York Knicks. Nikola Mirotic added 22 points and E’Twaun Moore had 19 as the Pelicans finished a three-game road trip winless, sinking to 2-9 on the road overall and 0-4 without Davis this season. In a game with 14 lead changes, New Orleans held the advantage early in the fourth quarter before the Wizards used a 15-5 run to pull away. Porter tipped in a miss and then slammed in Wall’s alley-oop feed to put Washington up 113-104 with 5:15 left, the largest lead in the game to that point. Rivers added a pair of runners to close the stretch, giving Washington a 119-107 lead with 2:06 to play, sealing a win that came despite continued team struggles from beyond the arc. Washington went 10 of 29 from 3-point range and only 3 of 13 after halftime. The Wizards used a four-guard lineup for part of the fourth quarter, featuring Wall, Beal, Rivers, Tomas Satoransky and forward Markieff Morris. Davis returned in the fourth quarter Friday in New York after hurting his hip in the third, but was held out of the back end of the Pelicans’ fourth back-to-back game set this season. It’s unclear if he’ll be available for New Orleans’ next game on Monday. Pelicans: Used their eighth different starting lineup of the season because of Davis’ absence. . Have allowed an average of 126 points in their four games without Davis this season. Wizards: Porter scored 16 points over the first 7:21 of the game, hitting all three of his 3-point attempts and 6-of-7 shots overall. . C Dwight Howard (sore glute) missed a third consecutive game. He has played in only nine of Washington’s 19 games this season. Pelicans: Host Boston on Monday night. Wizards: Host Houston on Monday.